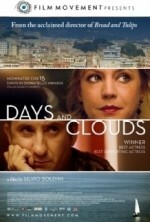 There's both a sickening voyeurism and an endearing, if unreasonable, hopefulness at work in Silvio Soldini's brutal relationship drama Days and Clouds. With a sadist's talent for stomach-flipping emotional turmoil and an eye for tragic entropy, Soldini captures a discomfiting portrait of a middle-age relationship in decline. The marriage of wealthy professionals Michele (Antonio Albanese) and Elsa (Margherita Buy) begins to disintegrate overnight when he reveals that he was fired two months ago. Out goes the townhouse and Elsa's academic ambitions as an art historian, not to mention the couple's fragile illusion of marital peace. Crushed by economic realities that are alien in their privileged experience—a meager lifestyle, long hours in demeaning jobs, a grubby flat—Michele's apathy and Elsa's resentment grow. Soldini doesn't evoke much sympathy for the pair, especially Michele, but he exhibits a morbid fascination with the poisonous nature of denial and silly pride. While the story is fitful, even dreary at times, it possesses an ugly authenticity, reflecting the haphazard realities of mature lives in perpetual crisis. Ultimately, Days and Clouds compels in the manner of a horrific, slow-motion calamity, leaving us wondering if anyone will emerge from the wreckage intact.